You might think that, given the widespread love for Mega Man Legends (and the loud outcry when Capcom cancelled #3), a spiritual successor wouldn’t have trouble finding funding. Yet Red Ash, a Kickstarter by Mega Man designer Keiji Inafune that’s just about as close as we’ll ever get to a Mega Man Legends 3, hasn’t made much of a splash. It’s still got 25 days left, sure, but right now it’s sitting around $335,000, well short of that $800k goal. Usually, big hyped Kickstarters like this are funded within a day or two. Maybe it’s because Inafune’s first crowdfunded game, Mighty No. 9 still isn’t out yet, so we don’t know whether he can deliver on his promises. Maybe it’s because the Red Ash Kickstarter pitch didn’t resonate with people. Maybe it’s because they launched it on July 4 weekend. Maybe it’s because Inafune is also currently working on a Mighty No. 9 movie and a Microsoft-published Xbox One game called ReCore, so people are wondering why he needed to launch not just one but two different Kickstarters (for a game and an anime) to raise enough money for Red Ash. It could also be the whole console thing. When Red Ash first launched, it was PC-only, which made very little sense and turned a lot of fans off. Then, yesterday, the folks behind the game announced a console stretch goal—if they hit $1 million, they say they’ll port it to a console. Just one. They won’t decide which one until after the game is backed. This brings up another question we’re sure you’re curious about: which console will it be ported to? Ideally we would love to port the game to all 3 current home consoles: PS4/Xbox One/Wii U. But porting Mighty No.9 taught us exactly how much it costs to port to a single console (which includes not only the port work itself, but also debugging and all other costs that add up). We take our ports seriously, and though there may be some sticker shock at the cost, we are planning wisely with the money from your support! Another reason that we can’t announce the console now is because we need to negotiate with the console makers. It’s a big assignment for us, but we are confident we’ll have great support due to the team’s prior work with the consoles. We will keep you updated right here with all the latest developments on that. 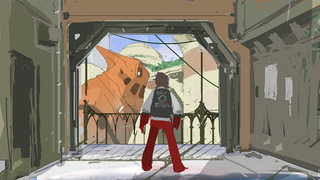 Most importantly, we want to port RED ASH to the console most wished for by our backers. We will put up a preliminary poll soon, so you can make your voice heard and let our team know where you want RED ASH on consoles first! Then, once the campaign ends, we will send a survey to make your final vote! The survey will only be available to backers, so be sure to tell everyone you can about this big news! It’s admirable that they’re being honest about the costs of porting, but man, this is a sloppy way to do business. How can Inafune and company ask for people’s money before we even know what platforms the game will be on? If someone doesn’t own all three consoles, why would they ever back Red Ash when there’s a significant chance they might not even be able to play it? Seriously, what are these guys thinking? I imagine they’ll hit $800,000—Mega Man Legends fans are too passionate to let this go unfunded—but if the team behind Red Ash is disappointed at this lack of momentum, they have only themselves to blame.